August, 2010 | MDC - Marketing. Design. Creative. Are you doing what’s EASY? I’ve written about Danielle LePorte previously. And I just couldn’t resist doi ng it again after reading “True Strengths and the Metrics of Ease”, a one chapter gold nugget of inspiration taken from her recently launched “Fire Starter Sessions” e-book aimed at entrepreneurs. The book defies the idea that we all have to “pay our dues” or “fake it till we make it”. This is not the lazy person’s way out. It doesn’t mean that working hard isn’t valuable – it is! But the difference is in working on the things that come easily to you. Things that you really know how to do. Being well rounded isn’t the name of the game. Being brilliant at SOMETHING is. Think about the things that cause you to procrastinate. Chances are they are probably not your strengths. Can you sub out some of those tasks to someone else so you can focus on your mastery? Along with many pages of inspirational bites, a load of resources, and two videos in this chapter, she also includes two worksheets to help you determine what your true strengths are and how to incorporate them into what needs to get done in your business. 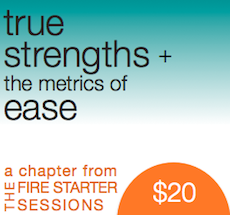 You can order this chapter right here for only $20, and if you decide to purchase the entire Fire Starter Sessions book later ($150), your $20 will be credited toward it. (Full inferno also available above 🙂 . Go on. Get inspired. Sink into ease.